Korea is a country of stark beauty and a troubled history. Many in the western hemisphere have not been exposed to many of their artists. 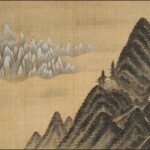 While I do hope to have a section that discusses their contributions to the art world, this page serves as a place that showcases famous paintings of Korea. Korea has proven a challenge for me. It was a unified country prior to World War II but most of us born after 1945 have only seen a country divided by so much more than the 38th Parallel. 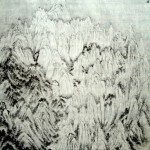 I had originally planned on keeping the two states separate but with the addition of the biography of Jeong Seon, I see the futility in such an endeavor – he painted mountains in present-day North Korea but is honored with a museum in the South. Since I don’t foresee this site including many works which were completed after 1945, it would seem more appropriate to identify all of the artists as Korean, without designating which part of the country they came from. OK, so moving on beyond the politics of the region, let’s celebrate the beauty of the Korean Peninsula and the famous paintings of the Korean landscape.